After releasing some relatively successful covers in the past month, here we have Trails and Ways gearing up for their debut full length album Trilingual. 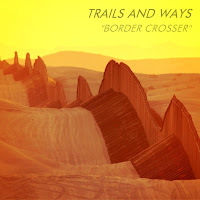 "Border Crosser" will be the first official release from the LP and as usual, it's magical - what else did I expect? Trails and Ways are becoming extremely addictive, in a good sense. The haunting whistles and the clean cut beautiful guitar work make this track so very dreamy.